We have a new exciting addition to our array of remote SCENAR and COSMODIC attachments – remote electrodes made out of SHUNGITE, a Russian miracle stone. Shungite receives its healing power from one of its elements, fullerenes – a globular hollow molecule consisting of several dozens of carbon atoms. Fullerenes, getting in our body, behave as the most powerful and most long-acting antioxidant. When fullerenes were discovered in shungite a few decades ago, it became a sensation. The importance of this discovery is that until that time, scientists were aware only of three modifications of carbon – diamond, graphite and carbyne. The new molecule shows amazing healing properties. It slows down the growth of cancer cells, and substances from fullerenes can slow down the activity of the AIDS virus. The discovery of the fullerene was a real breakthrough in nanotechnology and was declared a sensation of the 20th century. The scientists who have made it received the Nobel Prize in chemistry in 1996.
and on top of that, despite the fact that it is a stone, shungite is extremely electro-conductive! Imagine adding these healing properties to the healing powers of SCENAR and, especially, COSMODIC! The electro-conductivity of shungite makes it possible. P.S. 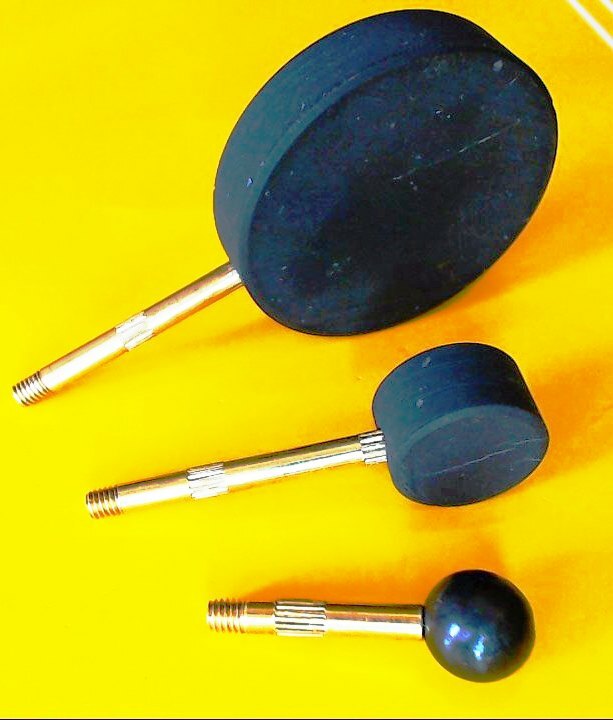 Since all shungite electrodes are hand-made and depend on a type of the stone supply, the models may vary. GO HERE to see what shungite electrodes are currently available. 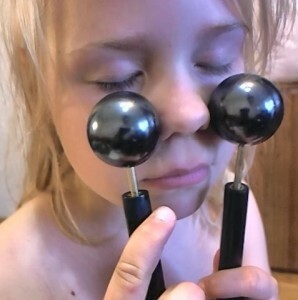 Q: Why are the shungite electrodes so expensive? A: There are several reasons. First of all, because shungite is a rare mineral. Second of all, because it is very fragile and a lot of material is wasted before one electrode is made. And third, only the quality shungite is high-priced. Let me explain the last sentence. The unique qualities of shungite depend on the concentration of fullerines in it, and this varies quite a bit. The higher the concentration the more “healing” is shungite, the more fragile, and the more expensive. The highest quality shungite is called “elite”, and it is very rare, because the natural resources of it are practically depleted. Keep the above in mind when you are weighing pros and cons of buying cheaper vs more expensive shungite electrodes. The good deal here may not be the cheap one. Q: Are there COSMODIC electrodes made out of the “elite” shungite? A: It may be :-). We may soon have the “elite” shungite electrodes, but so far it is just “maybe”. The testing has not been finalized yet. 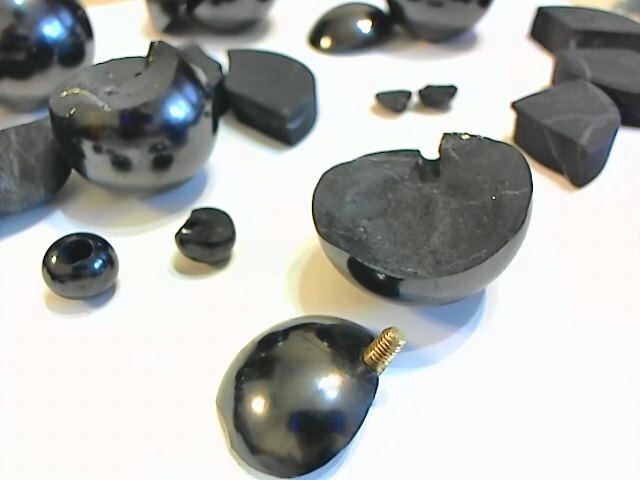 The problem is that the extremely fragile “elite” shungite cannot even be molded into a standard shape of the electrodes; it falls apart in the process. Therefore, every electrode will have to keep the natural, “as is” shape of a particular piece of stone – and as such, every electrode will be unique. Q: Do I need a separate set of handles for each pair of electrodes – and can I combine different shapes of electrodes in one pair? A: No, you do not need a separate pair of handles for each pair of electrodes; you can easily change electrodes on the same handles – and yes, you can place one shape of the electrode on one handle and a different shape on the other and successfully combine them in the same treatment procedure. That gives you a great treatment flexibility.